In conversations I’ve had in recent weeks with various political consultants, they make it sound like Ranked Choice Voting is the scourge of all our problems. I wish I could just dismiss it as griping from seasoned operatives who were more comfortable playing the old system, but the reality is that now two Supervisors are actively promoting efforts to go back to two-candidate runoffs. In the next few months, San Franciscans will hear all sorts of scare tactics designed to drive voters to repeal Ranked Choice Voting. Today, I will address the one you’ll hear about the most – that it “disenfranchises” voters because a candidate can win an election without a majority. While RCV defenders must address the problem with “exhausted” ballots, far more voters are disenfranchised in a runoff system – where turnout drops precipitously, especially among young voters and people of color. RCV should be amended so that voters can pick more than three choices, which would make it far easier than forcing voters to come back a second time, in order to ensure that the winner gets a true “majority” of all votes cast. 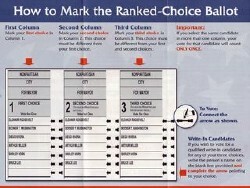 An “exhausted” ballot, in Ranked Choice Voting, happens when a voter either bullet-votes for one candidate who finished poorly – or filled out three choices on their ballots, but all three were eliminated. A ballot in the 2011 Mayor’s race, for example, that picked Leland Yee, Bevan Dufty and David Chiu would have “exhausted” – because none of these candidates were the top-two finishers. In those cases, the vote cannot be counted. At the Board of Supervisors meeting on November 8th where he and Mark Farrell first proposed eliminating Ranked Choice Voting, Supervisor Sean Elsbernd said that “nine out of the eleven members of the Board of Supervisors were not elected by a majority.” What he meant, of course, is that if you include all the “exhausted” ballots in an RCV count, only Carmen Chu and Scott Wiener were elected with a majority of votes cast. Which is technically correct, but intellectually dishonest. Because the same was true (if not moreso) under the old two-candidate run-off system, where far fewer voters returned to the polls in December – and therefore, the winner got less than a majority of votes cast. Take the District 1 Supervisor election in 2000, for example, which used the traditional two-candidate run off. In November, more than 24,000 voters turned out for that ballot. Supervisor Michael Yaki came in first-place with 9,218 votes, with Jake McGoldrick a distant second. Because no candidate had a majority, we had a December run-off – and turnout declined by 40%. McGoldrick won in December with only 7,486 votes. While that was a “majority” in December, it was less than 31% of all votes cast in November. Fast-forward to 2008 – where District 1 had another fiercely fought Supervisor election. After the Ranked Choice Voting tabulation, Eric Mar defeated Sue Lee – but because of “exhausted votes,” roughly 10% of the ballots were eliminated. Sean Elsbernd is correct that Eric Mar was “not elected by a majority” – because if you count exhausted ballots, he only got 46% of the vote. But the choice here is obvious: would you rather have a candidate who wins only 31% of the district, or 46%? Should we be more concerned with 10% of ballots that were exhausted, or 40% of the voters who didn’t come back? While many will recite the 2003 Mayor’s race, where turnout in the December runoff exceeded that of the November election, that election was more the exception than the rule. In 10 of the City’s 14 December runoffs between 2000 and 2003, voter turnout declined by more than a third. Overall, two-candidate run-offs that required voters to come back a second time are far worse for democracy than “exhausted ballots” in RCV. Having worked on field operations for countless campaigns over the last 15 years (from mobilizing Cal students to vote in local Berkeley elections, to Tenderloin SRO tenants), I can tell you – it’s a lot of work dragging voters out to the polls, and runoff elections are brutal. Just because you got someone to vote once is no guarantee they will come back a few weeks later. Low-income people, immigrants, young voters, renters and those who are transient, are least likely to return a second time – when the “real” decision is made. Are some voters “confused” with Ranked Choice Voting? Studies have shown there isn’t any more confusion, but politicians and consultants with their own agendas will continue to fear-monger with anecdotes. Any real confusion that exists is only because RCV is a relatively new system, which will take a few elections for voters to get accustomed to. Is there a problem with “exhausted” ballots? Sure, but the solution is not to repeal RCV. A first obvious solution to “exhausted” ballots is more education and outreach to explain that voters should completely fill out their ballots. If they want their vote to count, don’t just “bullet-vote” your first choice – but also pick a second and third choice. And don’t just vote for three unserious candidates who are going to lose, because you’re wasting your vote. Make sure at least one of your three choices has a reasonable shot of winning. But especially in RCV races with more than three serious candidates, we are seeing more instances of “exhausted ballots” – where a voter picked three candidates, but all three were eliminated. In this year’s Mayor’s race, roughly 28% of all ballots were thrown out. Twelve percent were because the person “bullet-voted” for a losing candidate, but 16% were because the voter picked three people who were neither Ed Lee nor John Avalos. The clear answer is that RCV must be expanded – especially in elections with multiple viable candidates – to include more than three choices. Portland, Maine just had their first mayoral election with Ranked Choice Voting – where voters got to “rank” all fifteen candidates. If San Francisco had such a system this year, we would not have seen 16% of all ballots “exhausted” – because voters could have likewise ranked all the candidates. Fortunately, Dominion Voting Systems – which the City’s Department of Elections uses as a vendor for its voting machines – has a new digital scanner that allows up to eleven rankings for RCV elections. It’s still in the middle of federal certification, and then go through state certification, but in a few years (we hope) San Francisco will be able to upgrade to the new equipment. Hopefully, this will help clear bugs in the system.